Part I of this three-part series set the stage for examining intermittent power sources, especially wind, as viable sources of electricity. Part 2 addresses one of the critical power considerations: power density. In his MasterResource series, Vaclav Smil compared the power densities of a range of fuels for electricity production, which demonstrates the inadequacies of renewables. David MacKay also makes a useful contribution to this topic. [i] Table 1 summarizes the results, which take into account entire fuel cycles, transportation and transmission requirements for a range of assumptions. Note that all renewable energy sources are ten to over a thousand times less effective than those serving our needs today, with wind providing one of the poorest performances of the renewable sources shown, outside of wood. 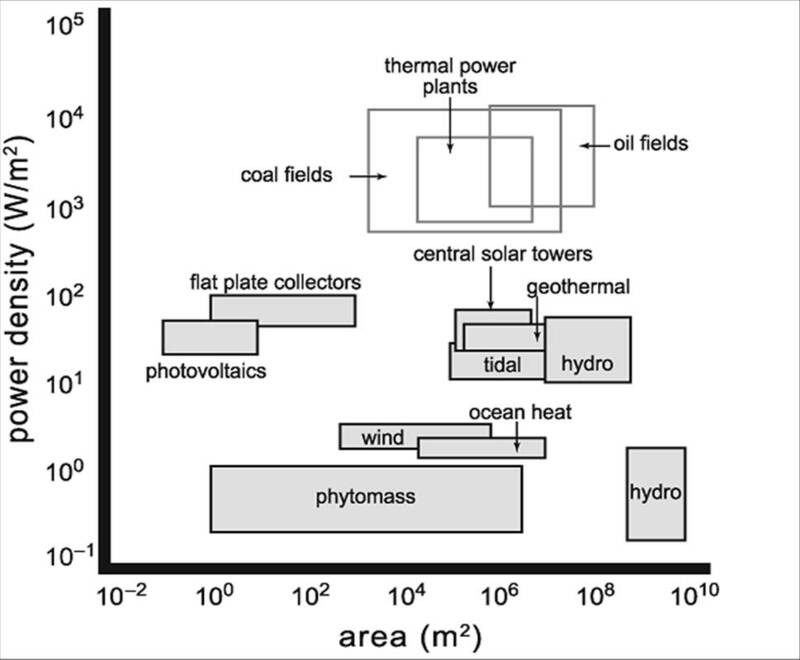 Areas required for renewables are large because of the dispersed, and often remote, nature of their energy supply. In the case of wind, it is acknowledged that some agricultural activities may be possible within the areas needed for wind turbine separation, although there is growing experience that this may not be the case (see here and here), but this misses the point that many activities will not, and substantial implementation of wind will increasingly impose on these. Also, there are space requirements beyond the wind turbine base footprint, for example, access roads and additional buffer zones for a variety of reasons, including human habitation and increased transmission lines (more on this later). The next largest category is transmission lines, accounting for about one-quarter of land requirements for electricity generation. This is important because the current emphasis on additional transmission lines to accommodate new renewables, especially wind with the quantities projected, adds substantially to the areas required to support these energy sources. The existing grid fans out from today’s high power density generation sites to the low power density (diffuse) consumption requirements of buildings, factories and cities. Wind and solar require large grid increases to provide an additional ‘fanning out’ at the generation end because of the inflexibility and dispersion of the locations required to collect the diffuse energy supply. Apart from the not inconsequential grid considerations, what is the significance of the low power density of renewables? Any transformation from today’s high power density generation facilities will require many significant adjustments, which will take decades to accommodate for economic, technological (e.g., massive storage capabilities and electrification of transportation) and societal and human nature reasons. The latter refers to the need for the developed nations to adjust their use of primary energy supply use downwards to allow for the inevitable growth of this in developing countries. Other factors include de-urbanization (in part moving closer to the sources of renewable energy), substantially more careful use of energy, significantly improved energy efficiency in buildings (which depends largely on new structures, for example, designed to better accommodate substantially improved photo-voltaic energy converters), transportation and distribution systems (e.g., for distribution of hydrogen fuel produced centrally by renewable sources, if this proves feasible). The practical time frames for these are many decades, and for some, the end of the 21st century. As described in Part I, this time scale creates a race with that for concerns about climate change impacts. Therefore short to medium term policies (the next 10-30 years) should focus on those electrical energy sources that have the energy and capacity requirements that best address this. The net of this is that the current rush to massive implementations of wind plants is an extremely premature, unwise policy. Of the two, wind and solar, direct tapping of solar energy has by far the most useful and effective outlook for renewables, but the entry point for utility-scale commercialization of this is still many decades away. We need a well thought out energy use evolution in the meantime, not a revolution. As a result, these new energy infrastructures would have to be spread over areas ten to a thousand times larger than today’s infrastructure of fossil fuel extraction, combustion and electricity generation: this is not an impossible feat, but one posing many regulatory (environmental assessments of affected areas, rights-of-way permission and inevitable lawsuits), technical and logistic challenges. Higher reliance on renewable energies may be desirable (mainly because of perceived environmental and strategic reasons) and technical advances would also make it an increasingly appealing economic choice–-but inherently low power densities of these conversions will require a new system of fuel and electricity supply that will be able to substitute for today’s dominant practices only after decades of gradual development. Power density alone establishes wind as unworthy of the diversion of significant amounts of national wealth, human resources, especially within our governments, and time, all of which could be more productively used. However, wind also fails in the other dimension of power–capacity value. This is the consequence of its randomness and intermittency of supply, which has the effect of shifting the power density comparison even less favorably for renewables. This will be addressed in Part III. [ii] Smil, Vaclav (2008). “Energy in Nature and Society: General Energetics of Complex Systems”. The MIT Press. Page 383. In my view it is all about compatibility. We have a fairly constant demand for electricity, in that we need it when we want it, 24 hours a day, 7 days a week, 52 weeks a year, etc. We have built a range of applications that rely on this relatively constant supply. When we add an intermittent supply of electricity into the grid, it is the product that no-one wants, or anyone can use. Unless we can find some super-efficient storage mechanisim, then all these ad hoc forms of renewable energy being a useful addition to the energy supply are either a fantasy in someone’s mind, or the object of some rent-seeking financier’s desire. Wind power is like communism. The reason it hasn’t worked is because it’s never been implemented correctly. Wind “power” has, for millennia, been implemented “correctly,” if by this is meant that it was used in accord with its best potential. The Clipper ships of yore were wind’s apotheosis, and the Dutch famously used the technology to make their polders and beer. Then came that doughty Scotsman, James Watt, and his infernal steam engine….